As the 2018 Winter Olympics in PyeongChang, South Korea dazzles with massive drone displays and American triple axels, spectators in the main Olympic stadium have been left out in the cold. The $109 million, pentagonal stadium has 35,000 seats but no roof or heating elements, and will only be used four times before being torn down. The decision to build a low-cost arena designed for planned obsolescence isn’t a crazy idea. 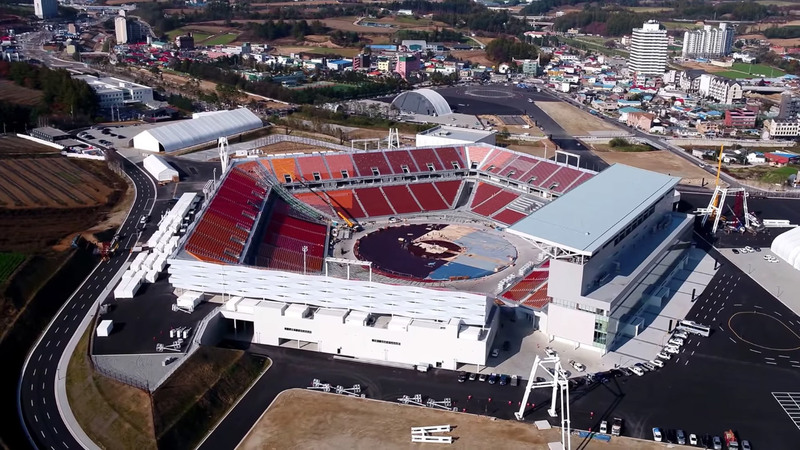 With the total cost of the games approaching nearly $13 billion, keeping a 35,000-seat stadium running when PyeongChang County only has 40,000 residents was prohibitively expensive. Even the International Olympic Committee (IOC) has warned that Olympic venues can be become “white elephants” after the games end, as they historically have within other hosting cities. Although the South Korean government had hoped the Olympics would turn the snowy and mountainous PyeongChang into a winter sports destination for tourists, enthusiasm within the country for winter sports has been particularly muted. Because no viable alternatives were proposed, PyeongChang Olympic Stadium was designed to be disposable and will only host the opening and closing ceremonies of the Winter Olympics and the Paralympic Games before being demolished. Cutting costs by leaving out a roof might have worked during the Summer Olympics, but at half a mile above sea level, PyeongChang is one of Korea’s coldest areas, and this year’s lows are breaking records. Polycarbonate walls were installed at the stadium’s top levels to shield spectators from the wind, but guests were given blankets, heating pads, and raincoats to keep warm and gas heaters were installed between the aisles. Seven people were repeatedly treated for frostbite after an hour-long opening event in November, where temperatures hovered around 12 degrees Fahrenheit, though they had risen to the low 20’s by the time of the opening ceremony proper. Disposable, temporary, and even movable stadiums have been in demand lately, as cities around the world grapple with the challenges (and costs) of repurposing single-use venues once an event ends. Qatar recently unveiled their Ras Abu Aboud Stadium, which uses removable shipping containers as building blocks so that the arena can be moved after the World Cup. The 2018 Winter Olympics closing ceremony will take place on February 25, 2018, while the Winter Paralympics will run from March 8 until March 18.